Create beautiful Easter bunny and Easter egg sugar cookies to give as special gifts this coming holiday. 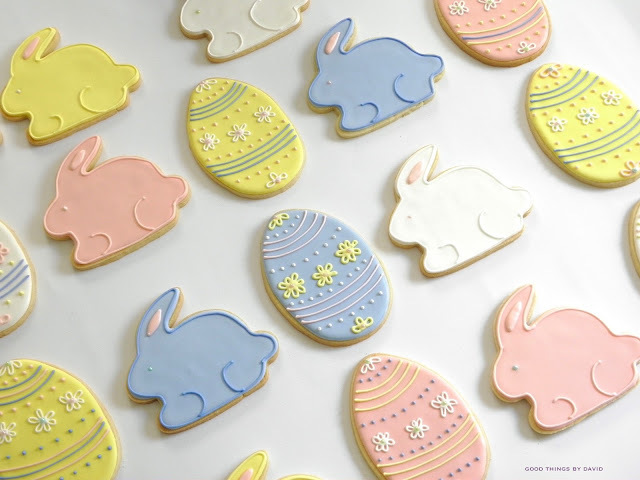 A few decorated treats can easily be placed into Easter baskets for the kids, but they can also be baked by the dozen for favors at your Easter luncheon. 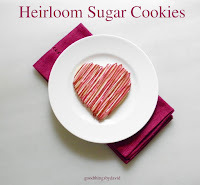 Elegant, yet easy to do, each of these cookies can get embellished with any number of sprinkles, pearl candies or sanding sugars. You can, however, keep them simple and charming without any edible ornaments. With only four colors of royal icing, there is minimal effort in making a flock of bunnies and eggs. 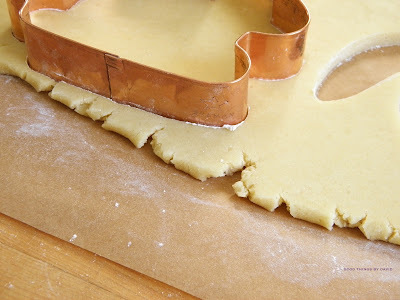 The first order of business is to choose the cookie cutters for this project and then make the cookie doughs. 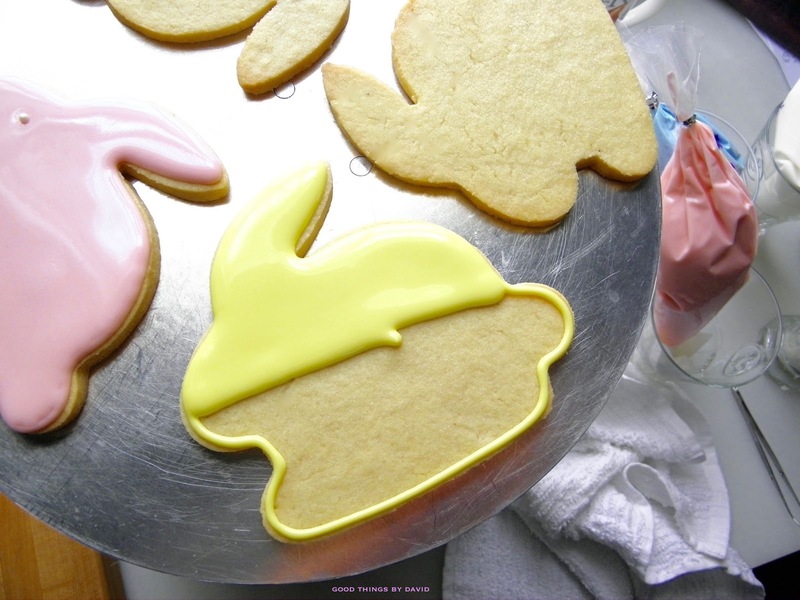 The bunny you see here is an American made copper cookie cutter from Copper Gifts. When I found out that my friend Janet was putting her entire collection of cookie cutters up for sale, I sought out the shapes I needed to fill my own collection and purchased them (thanks, Janet!). Each high-quality copper cookie cutter made from this midwest company gets stamped with a star and the name 'Braman'. The tops of the cookie cutters are finished with a rolled hem which makes them comfortable to use when cutting out cookies. 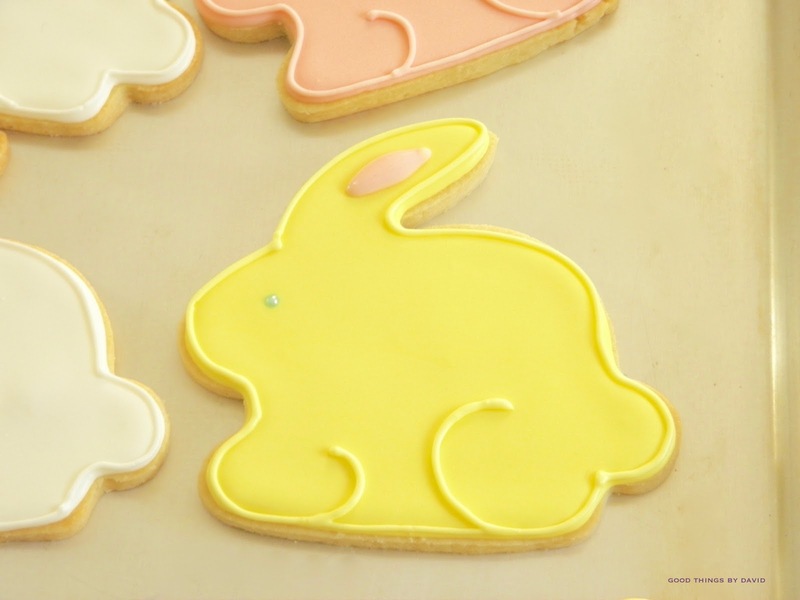 For these Easter bunny shapes, outline and flood the bases of your baked and cooled sugar cookies in pastel-colored royal icing. 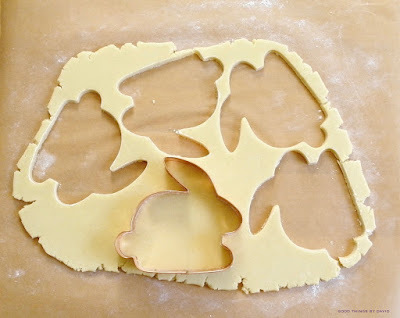 Note: one of the things I like doing with my cutouts after they've chilled thoroughly, is to flip them so that they face the other direction if I feel that they need it (this is done before I bake the cookies). I'm sure you've done the same thing before. Aren't they charming this way? Using a set of tweezers reserved for cookie decorating, carefully drop a pearl candy for an eye while the icing is still wet. Those beautiful pearl candies I'm using are by Wilton. The large Easter eggs were cut out with one of the large cutters from the Martha by Mail Egg Cookie Cutters Set. One thing I like to stress to individuals who ask about decorating with royal icing is the importance of sifting the confectioners sugar before mixing the icing; no exceptions. That is how one achieves such a smooth finish on the cookies. I like to take the icing as close to the edge of the cookie as possible without it spilling over. 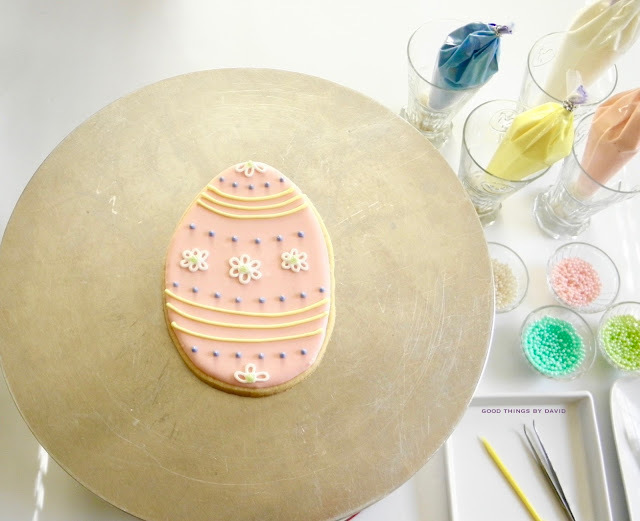 Pastry bags filled with icing, candy embellishments, a set of tweezers, a decorator's pick and a handy cake decorating turntable are some of the things you will need to make these Easter sugar cookies. 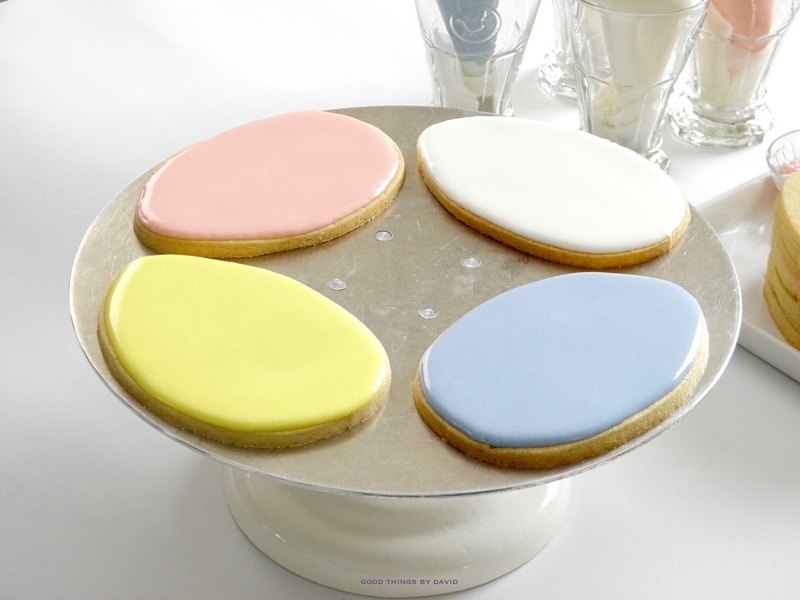 Keep things handy and set items on trays or plates with rims so that you can catch any wayward sprinkles. Pipe three loops/petals at each end of the egg using a #2 plain round tip and carefully center a pearl candy in the center of the petals. Pipe three parallel beads of icing using a different color of royal icing (#2 piping tip) in an arc, near the top of the egg, and near the bottom of the egg. 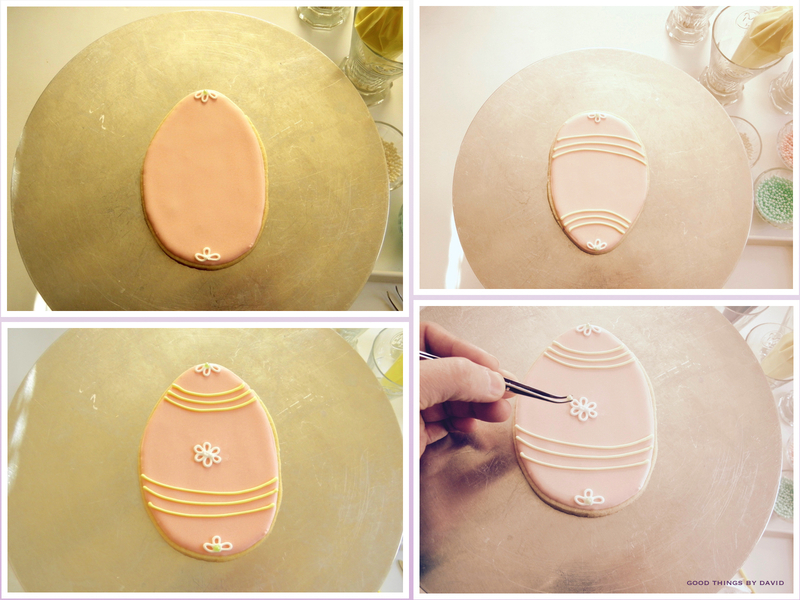 Make sure that the arcs are going in the appropriate direction in order to give the egg cookies contour. Pipe a 5 or 6 petal flower in the middle of the egg and carefully drop a pearl candy in the center. Pipe two more flowers along the center of the egg and place more pearl candies. 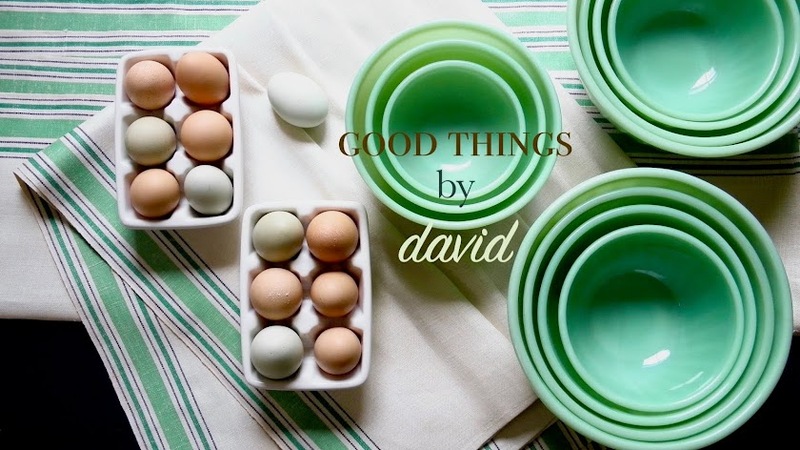 Last, but not least, pipe dots throughout the egg in a contrasting color. 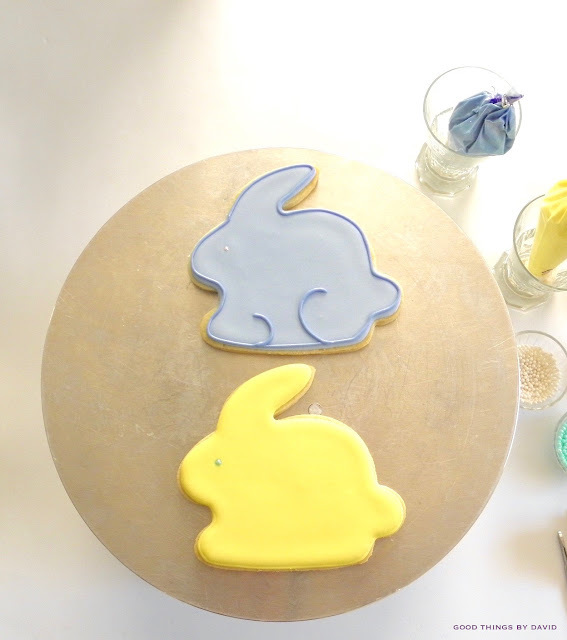 Using a #2 piping tip, outline the cookie using the same color of royal icing. Add two curved beads of royal icing to delineate the forequarters and the hind legs of the bunny. 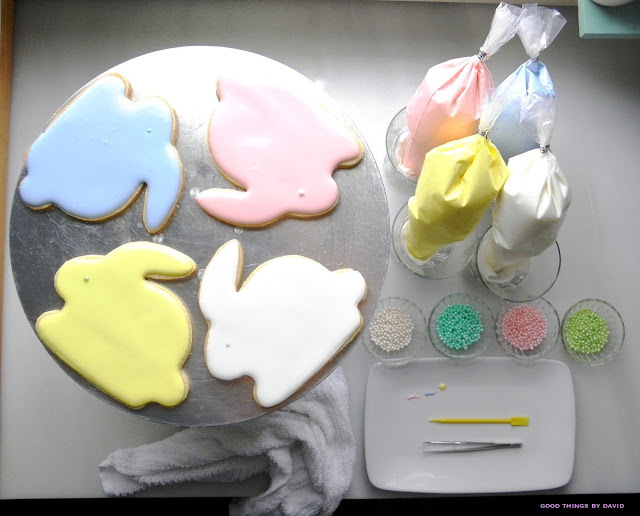 Once the cookies have dried completely, you can then package them up in clear cellophane bags tied with colorful ribbons. 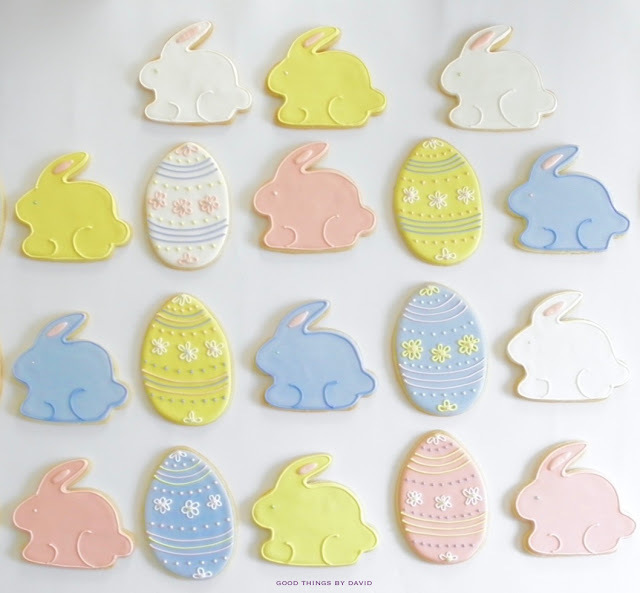 Those can then be added to Easter baskets or they can get hidden for a tasty Easter egg hunt! Imagine the fun of having to find these. 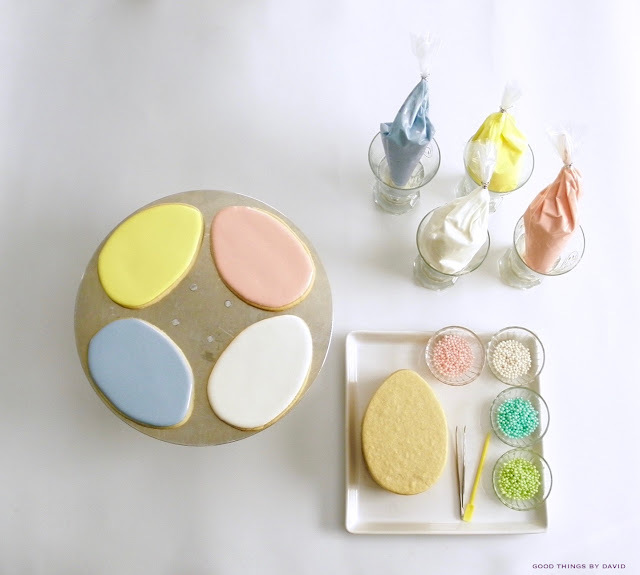 These decorated sugar cookies were so much fun to make for someone special down in West Virginia. I think the family is going to like them! 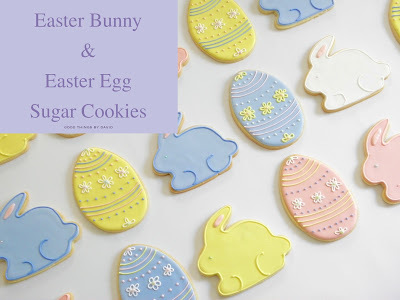 Nothing about these Easter Bunny & Easter Egg cookies is difficult, so don't hesitate for one moment to dig out your cookie cutters to make a few or a bunch of them this season. 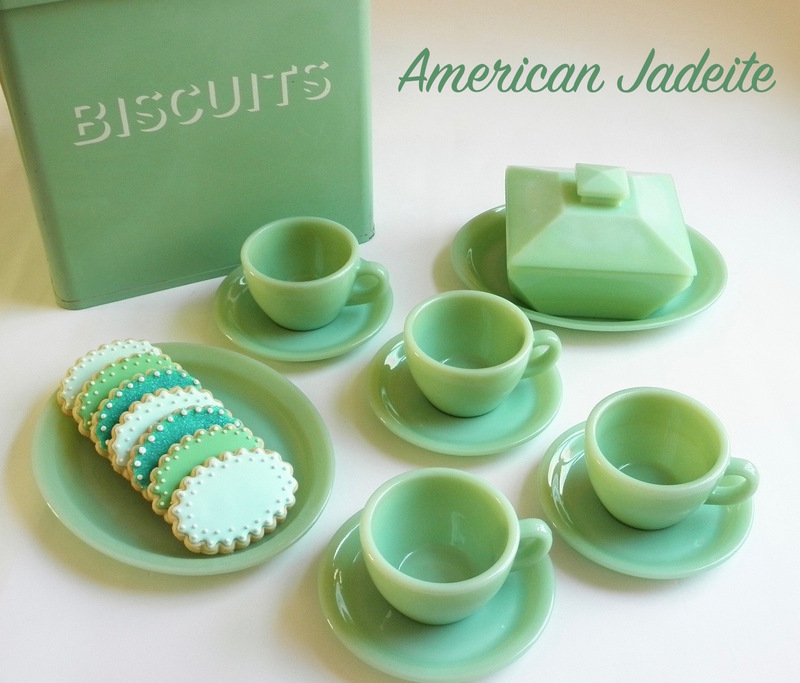 If I were to serve these at home I would lay them out on big white ironstone platters or I would place one giant cookie at each place setting for a special lunch. However you decide to share them, make them pretty and make them tasty. Everyone is going to want one. Your bunny and egg cookies look sweet and simple. I love the pastel colors! Thank you for mentioning CopperGifts! I swear every time I use one of those cutters that came from your pantry, a little bit of Janet magic gets into whatever I bake. Merci!